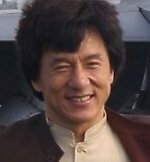 Movie superstar Jackie Chan enjoys chocolate ice cream. Many other celebrities too. Click on Jackie's photo to read more. Method: Mix together the egg yolks, sugar (and cornflour if using it) in a bowl, stirring well and beat until smooth. Pour the milk into a saucepan and heat gently on a medium heat until hot. DO NOT BOIL Then stir the hot milk into the egg and sugar mix. Mix well. Pour the mixture back into the saucepan and heat gently, stirring frequently. DO NOT BOIL. After several minutes it will start to thicken into a custard. At this point remove the pan from the heat, add the cocoa powder using a sift and mix well ensuring any lumps of cocoa powder have dissolved. Leave the mixture to cool. When the custard has cooled, transfer into a chilled bowl. For best results refrigerate the mix for at least 3 hours (overnight if you have the time). When the custard is thoroughly chilled, pour the double cream into a separate mixing bowl and whip until slightly fluffy. Stir the whipped cream into the chilled custard mixture. 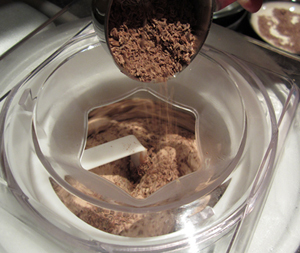 The mixture is now ready to transfer to the ice cream maker and freeze according to the manufacturer’s instructions.About 5 minutes from the end of the freezing cycle, drop the grated chocolate into the ice cream mixture through the ice cream maker opening (in the top). Serves 8-10. 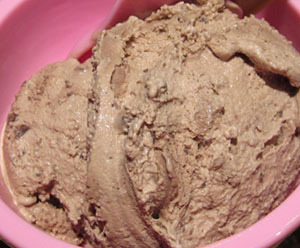 Come and see what people are saying about ice cream recipes - share the passion! Chocolate ice cream is great when you want an ice cream sandwich. Check out this one which I made at home - delicious! That's not all ... you can use chunky cookie instead of wafers. With chocolate ice cream, I find chocolate chip cookies work best. Especially tasty if you use freshly made cookies whist they're still warm. Here is a special family cookie recipe that I'd like to share with you - it produces the most fabulous chunky cookies! Oh and also for chocolate lovers, I developed a great recipe for white chocolate ice cream - rich and creamy but oh so delicious. Great if you want a self-indulgent treat. Click here for the ingredients and instructions.